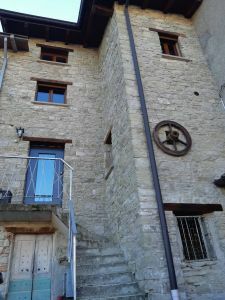 Beautiful ground-to-roof accommodation in the historic village of La Rocca, just renovated with high quality finishes and complete and custom furniture. Underfloor heating, solar thermal system, photovoltaic system, boiler room.It develops on four floors, ground floor tavern and bathroom, first floor living room and kitchenette, second bedroom and bathroom, third floor attic room / laundry / wardrobe. Available apart from a large adjacent garage.